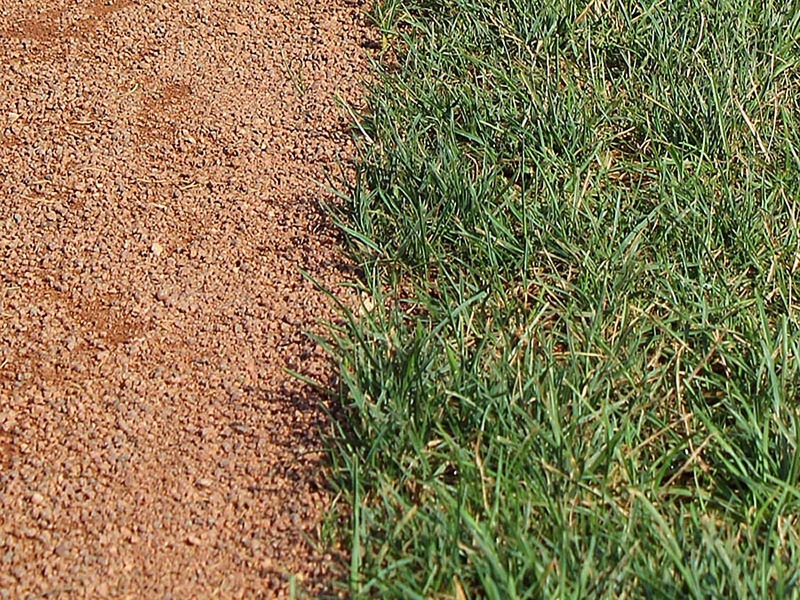 A “lip” is a raised bump of soil along the turfgrass edge. Turf will often keep the formation of the lip somewhat hidden from casual sight. But when the lip forms, it grows exponentially and creates a hazard for players. The most severe lips require off-season renovation. Lips are formed when material is moved. 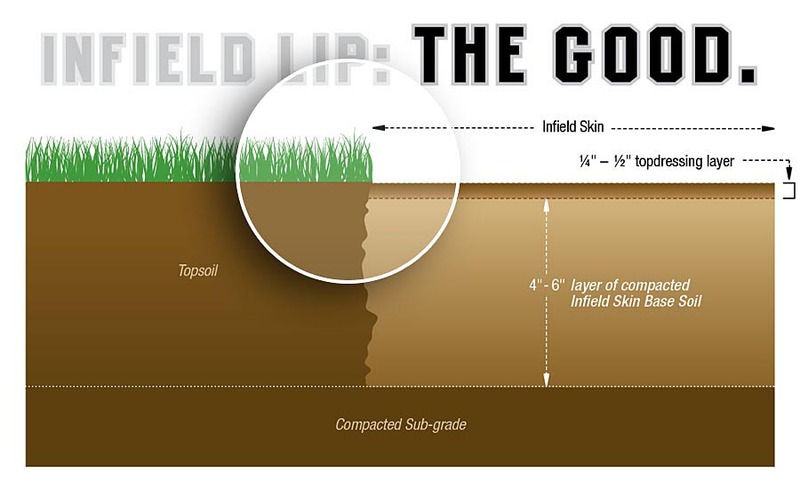 From fielders and baserunners — and sometimes from poor dragging technique — infield soil or loose topdressing is displaced and slowly accumulates where the soil meets the turf. 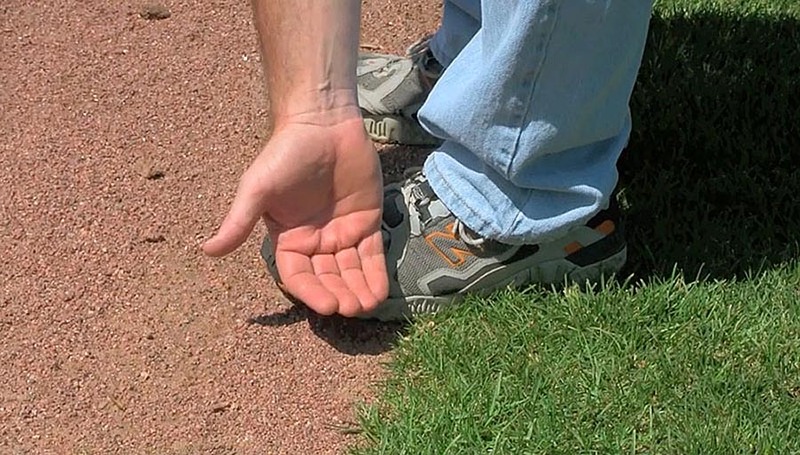 The buildup of this soil at the turf edge creates an uneven grade, or “lip”. Click the photos for more illustrative details about the good, the bad, and the ugly lips. 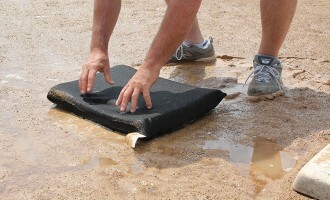 Rain and irrigation will “glue” materials together. With that in mind, it is important to keep lips under control before they can become fixed in place. 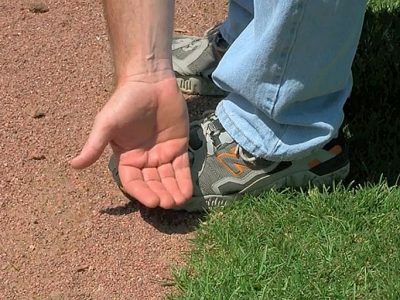 When they are left uncorrected they affect playability, can become an injury hazard, and make things much tougher on the field maintenance crew. 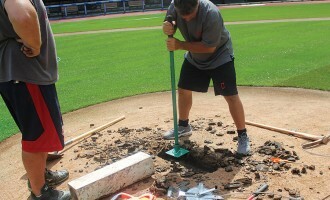 For players, bad hops impact play and can cause injury. If bad enough, a severe lip can also become a tripping hazard. For field managers, even slight lips can create dams that interfere with water drainage. 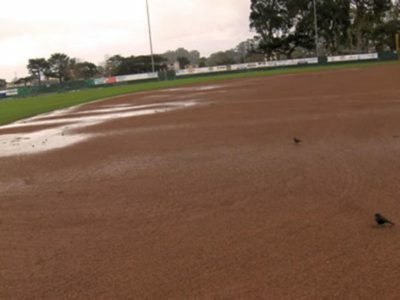 The more severe the lip, the bigger the puddles on your infield and the longer the delay before you can get teams playing again. Early detection is the key to effective lip management. The early formation of a lip can be difficult to see, so this is where your sense of “feel” comes into play. Wearing a flat-soled shoe, stand so the front half of your foot is on the infield skin (or warning track) and the back half on the turfgrass. 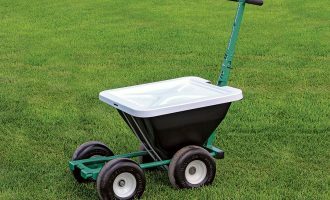 The transition from soil to grass should be smooth if there is no lip buildup. If you feel aridge along the grass edge then a lip is forming and will need to be removed. Watch the video next to learn more about the “feel method”. Don’t be fooled. 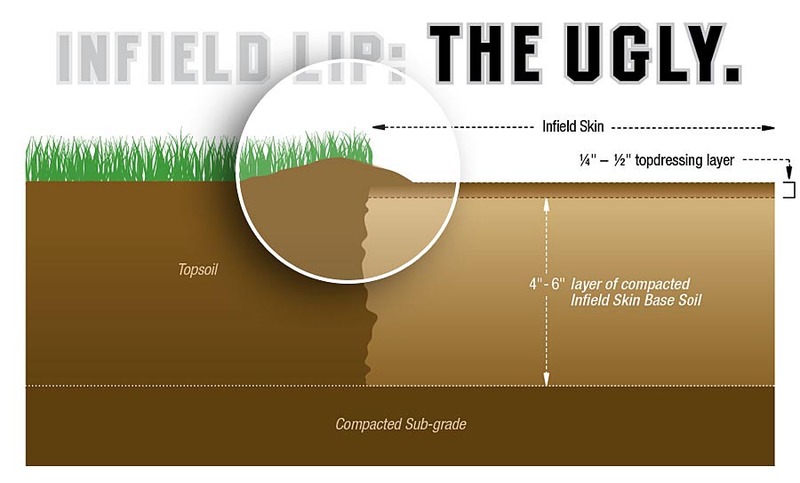 When checking for lips using the “feel method”, it is easy to confuse a lip with the grade of infield soil simply being lower. 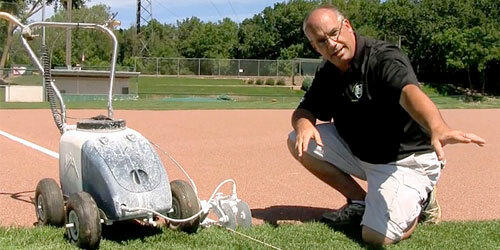 This can make the front half of your foot sit lower during the “feel test”. 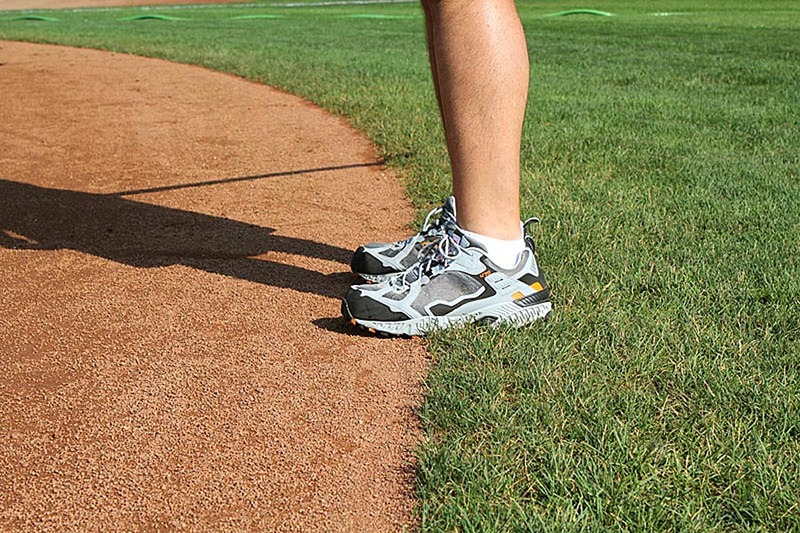 If it’s a lip you should only be feeling a ridge under the middle of your foot — not a dropoff. 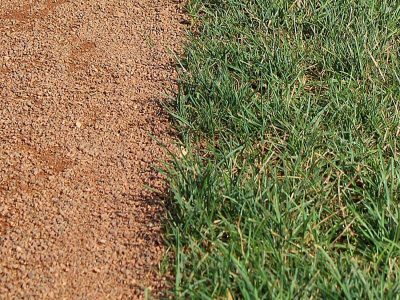 If your infield grade is low, just add soil to bring it even with the turfgrass grade and continue to regularly check for the formation of legitimate lips. Okay, so that’s the basics about lips, how they form, and what you can use to manage them. Before moving on, let’s make sure you have a good understanding of these basics. If you need to, use the numbered tabs above to skip around for a refresher. Log in to take this Pop Quiz to make sure you’re ready to continue to the next lesson.